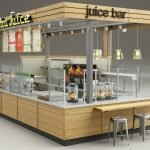 Open a digital and electronic products repair kiosk station in mall are very smart and profitable business ideas for 2019. 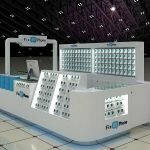 Here below is a very nice concept design for Blue Tech Digital Cell Phone Repair Kiosk ideas for in the mall. 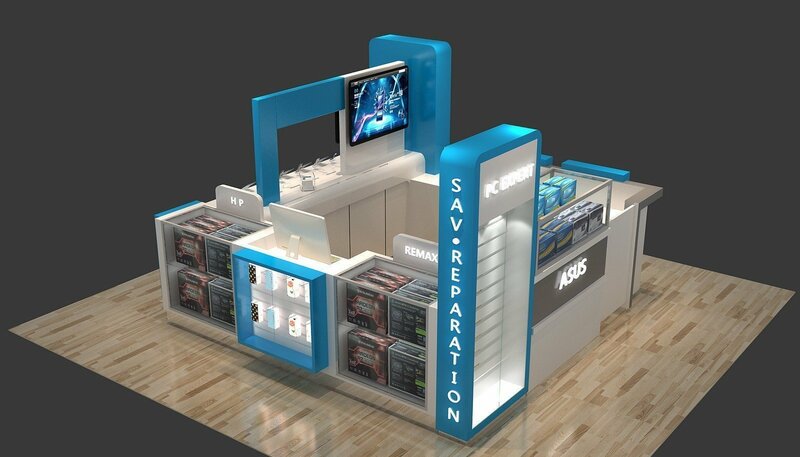 The whole kiosk is combined with tech blue and white color. Which is very suitable for digital products or electronics. 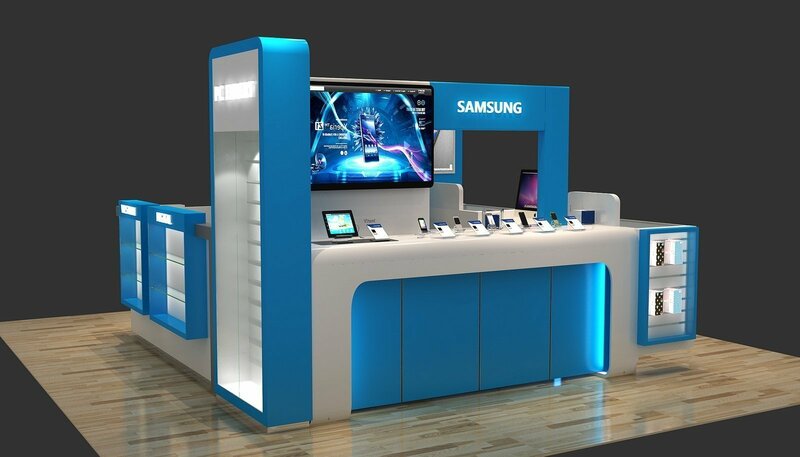 With a standard size 12*12 square kiosk, the customer can visit from all sides. On the right part of the kiosk where integrated with glass display showcase. cell phone covers and cell phone cases can display there. Back part of display cabinet with irregular arrangement makes the whole kiosk a unique and outstanding. Inside which has a repair counter allow worker repair products there. Unique offer best kiosk price for the displays. If you need to know the latest kiosk price and kiosk concept. Please do not hesitate to contact us. Because we do customized kiosks, So, we do not have any stock for sale. The average delivery time needs 15 days – 25 days. 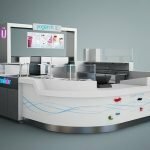 Unique Kiosk is a leading cell phone repair kiosk and electronic products repair kiosk manufacturer. 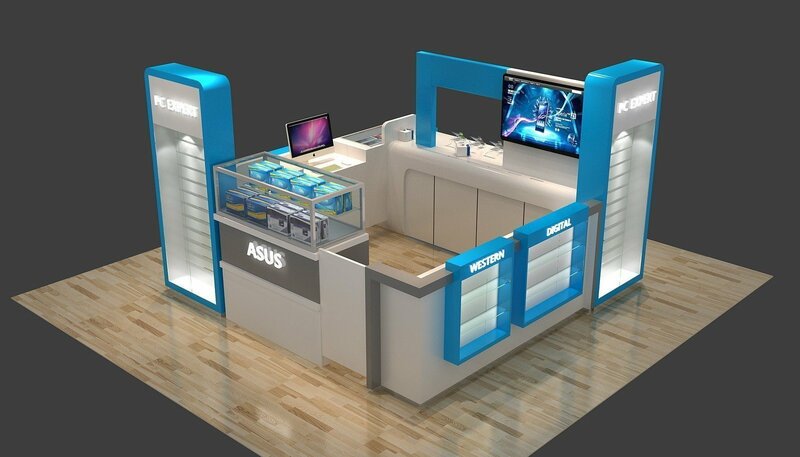 We custom design repair kiosk for mobile phone, tablets, laptop etc. Our experience designer can offer 3D design exactly according to customer requirements. You just need to send us the dimensions of the kiosk that you need and ideas you want to use in the kiosk. We will carry out a modern and high-quality business station for you. 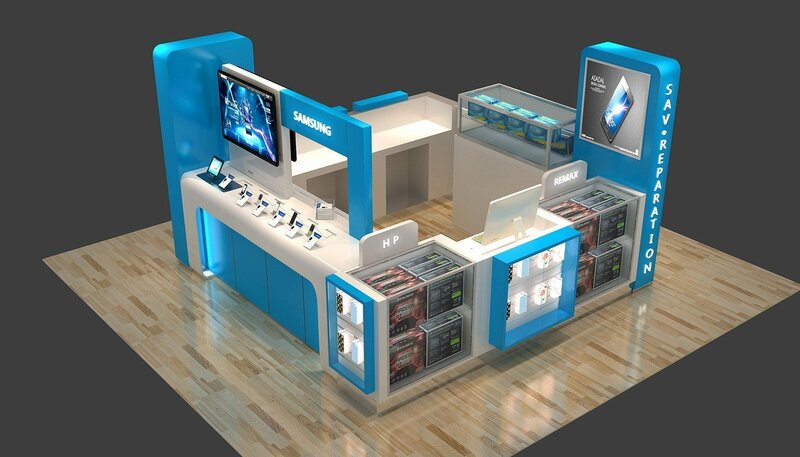 Especially for cell phone repair shop and digital accessories retail kiosks. We have over 15 years on those displays, No matter a repair counter or display showcase, even a led stripe light inside a cabinet. Unique also provide very details and fine work for you. 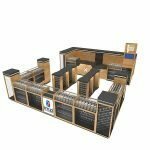 When you planning to open a mall retail kiosk for digital accessories business, Welcome to our site and choose the best design you like.